The Newest smartphone released by the south korean company is named as "Samsung Galaxy Round" (comes with some new wonderful features i.e Flexible curved display). The new samsung Galaxy Round is released just after the Samsung Note 3,Having some features similar to it But Samsung Galaxy Round has infact, Some better features that will let you to buy it leaving 'Note 3'. 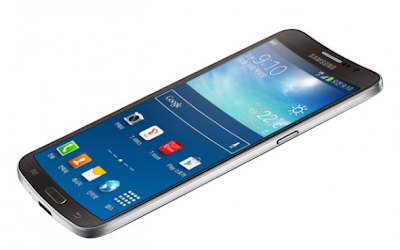 Curved Display: Samsung Galaxy Round is the world First Smartphone featured a curved.flexible screen display. LG also claims that they will announce a phone with Curved display screen in november but Galaxy Round has already released its smartphone having curved screen display. Roll Effect: A very good feature of Galaxy Round is 'roll effect' which will let you see the missed calls,alarms,date and time, and as well as battery life even if your home button is on sleep mode, you just need to rock/tilt your phone to see these. Gravity Effect: Another key feature of Galaxy Round is 'Gravity Effect' this feature is if you rock the phone with finger, a music-focused interface highlighting your tunes will welcome you! Operating System: Android v4.3 (Jelly Bean) operating system. Processor: Qualcomm Snapdragon 800 chip-set with the CPU of 2.3 GHz Quad Core processor and the graphics processor of Adreno 330. Memory: Galaxy Round has 32 GB of external with 3GB of RAM, and up-to 64GB of expandable memory. Display: Galaxy Round has Super flexible AMOLED(Active-Matrix Organic Light-emitting Diode) Capacitive Touchscreen with 16M Colors.The screen size of this smartphone is 5.7 inches with the resolutions of 1080 x 1920 pixels. Camera: The smartphone has 13 Mega Pixels primary Camera. Camera allows video recording at 2160p @ 30 fps and 1080p @ 60 fps. Also having 2 MG of front camera. Weight: The phone weight is 154 grams. Battery: This smartphone has a removeable Battery with 2800 mAh power. So above we mentioned some specs and features of 'Samsung Galaxy Round' I hope you read this post. and also be sure you shared this post with your friends. Note that You can also write a post for World Wide Tricks. "nOKIA sYMBIAN pHONES iS tHE bEST pHONE eVER bUILT"
Hmm thank you sir for your suggestion! Thanks man for dropping your comment!